Demonstrating their dedication to children and passion for public education, members of school district and county office of education governance teams throughout California gathered at the home offices of their state representatives to advocate for local governance and other issues vital to public schools as part of CSBA’s Board Member Action Day May 10. This was the second year that CSBA members have brought their advocacy messages to state lawmakers in their home districts rather than traveling to the state Capitol. A total of 164 school board members participated in this year’s advocacy effort, meeting in 83 district state assembly and senate offices. “To me it’s extremely important to participate in Board Member Action Day,” said Pat Shamansky, a CSBA Delegate from Region 3, a member of CSBA’s Legislative Committee and a board member in the Fairfield-Suisun Unified School District. 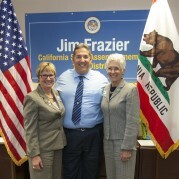 She met with Assembly Member Jim Frazier in his Fairfield office after traveling to Vacaville to talk with staff at Sen. Lois Wolk’s district office in Vacaville earlier in the day. “This is one of the few times that you have a real opportunity to participate with your assembly member or senator—to have a specific time to talk and make your points, to make yourself known. If you look at the Professional Governance Standards, you’ll see that they require boards to support and value education as well as to advocate for it,” she said. Laura Canciamilla, a CSBA Delegate from Region 7, said she believes these meetings with lawmakers and their staff are a critical part of developing what she called a “full time relationship” with key state legislators by visiting them frequently in their district offices, rather than traveling to Sacramento for a single day of advocacy. “We want to let you know who we are and where to reach us, so that when an important educational issue comes up, we can give you the stories behind the issues,” she said during a meeting in the Walnut Creek offices of Sen. Mark DeSaulnier. Canciamilla and seven fellow governance team members from Pittsburg, Dublin and Pleasanton unified school districts; Orinda Union Elementary and the Contra Costa County Office of Education participated in a cordial and spirited discussion of key education issues with DeSaulnier staffer Satinder Malhi, who clearly valued the chance to get local school board perspectives. 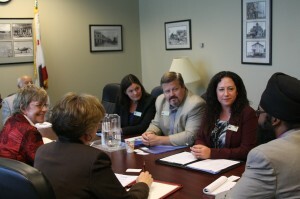 It was the second lobbying meeting of the day for many members of that delegation; some met with Assembly Member Susan Bonilla in her Concord office. Others spent the morning in San Ramon, bringing a local school board perspective on critical state issues to their meeting with Assembly Member Joan Buchannan. Shamansky and Judi Honeychurch, another Fairfield-Suisun board member, also made the most of their opportunity to make a case for restoring essential financial support to beleaguered public schools that have been battered by years of deep budget cuts. During their meeting with Assembly Member Frazier, they illustrated the need for more base funding by sharing a spreadsheet listing programs, services and positions the district has had to eliminate since 2007-08 due to budget cuts. “I’m all in,” he said, inviting the trustees to return after the May Budget Revision when the district knows more about its projected 2013-14 funding. Share the results of your Board Member Action Day meetings in a brief survey here, and see photos from participants around the state on CSBA’s Facebook page.